Whether your child has an uncommon name like my daughter does or a popular name, kids will delight in having an I See Me personalized lunchbox. 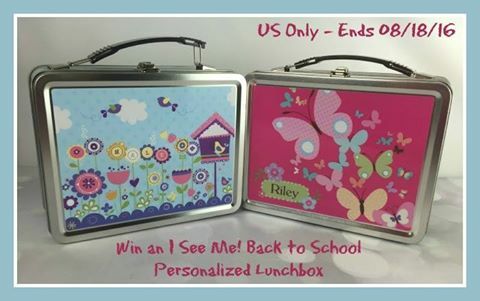 Kids love items with their name on it and what a fun way to start off the school year with a brand new lunchbox created just for them. There’s a variety of styles at I See Me, that there’s bound to be one that your little one would just love to have on their new lunchbox. Be sure to read more of Kristin’s review and learn how convenient and great priced this product is. In The Garden Personalized Lunch Box, would love this for one of my granddaughters. I love the God Loves You! Personalized Book. So cute! My daughter would love the Prima Ballerinas Lunch Box! I like the All-A-Flutter Butterflies Personalized Growth Chart. The books and growth chart are great, but I love the lunch boxes! I love the Dreamy Day Personalized Puzzle ~ my daughter loves puzzles! My very own fairytale book is what I would love to buy! I would get the Hello World Gift Set for my grandbaby due in Sept.
outer space personalized growth chart! I like my very own Pirate tale. It is a cute book! I like the All-A-Flutter Butterflies Personalized Growth Chart! love to get the princess all in one gift set for my little niece. I would love to have the personalized love is in the air growth chart for my granddaughter. I really love the My Very Own Fairy Tale Personalized Placemat! These are so adorable and entertaining for kids they’ll want to bring their lunch and show off. I love the cute personalized princess stickers. My granddaughter would absolutely go crazy to have them too, ha. I would say the personal lunchbox or the pirate’s booty.